Shockingly enough, Gartner’s recent research indicates companies are currently only realizing 43% of technology’s business potential. As the social world is becoming an increasingly overpopulated wrestling ring of companies from local startups to international corporations, long term success requires adequate preparation through the means of a formal social media strategy engrained throughout the culture of an organization. 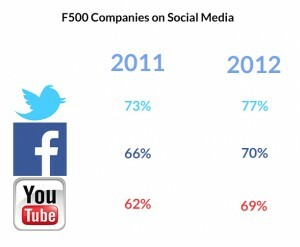 As 2013 saw an increase across the board in the importance and use of social media platforms, Facebook, Twitter and YouTube saw a yearly rise in Fortune500 company pages last year. Amongst the social behemoths of today’s Facebook and Twittersphere, common elements, shared and integrated into yearly financial initiatives of enterprise companies, are well laid out social policies combined with an effective social strategy. Recent statistics show that 684,478 pieces of content are shared on Facebook every minute; the only thing more difficult than attempting to calculate how many that is per day, is to deliver your content in a positive and flawless manner to maximize your social reputation. It is for this reason why the importance of social media training is echoed amongst industry leaders such as Beverly Macy and IBM’s Sandy Carter. In a study, conducted by Jeremiah Owyang, social crises were found to increase as the popularity of social networks appreciates prompting the overwhelming need for a strategy tying in crisis management training. For companies who are ahead of their years in recognizing the importance and potential of social initiatives, social crisis training is prioritized. Ford reminds its employees to “make it clear that the views expressed are yours” while Coca-Cola only allow employees to represent the brand after a social media certification program to mitigate risk. With social media training said to reduce reputation crisis costs by 33%, Owyang found 76% of all crises studied could have easily been averted as the number one contributing factor was recorded to be a lack of internal education. Amongst the 144 companies surveyed, 96% of employees who took part in formalized training were said to be fully prepared to handle a crisis situation versus 22% of employees who have not been part of such training. Recorded in Technorati Media’s 2013 Digital Influence report, social investment is expected to increase by 37% throughout 2013. Companies are gradually realizing that they can no longer leave unseasoned interns and newly graduated ‘Yo-Pros’ to take charge of their social initiatives. An obstacle, however, which further faces said companies is the social know-how of seasoned professionals. Although cued in on the business’ goals and objectives they are not necessarily aware of the science behind a successful social strategy. Digging further into this, it is, thus, unsurprising that the average age of today’s CEO, 55, goes hand in hand with the fact that only 12% of companies feel they are using social media effectively. The social universe has evolved from teenagers updating their friends that they’re #GoingToTheMall, to an all-encompassing SEO, Customer Service and Brand reputation tool which is key to all facets of today’s corporate market. In a recent survey, The Creative Group predicts that, over the next twelve months, 62% of executives plan on increasingtheir Facebook spending, 51% on LinkedIn and 50% on Google+. In another study, up to 88% of marketers want to know more of the social best practice tools to further engage with their audience. Multiple corporations are pumping millions into social media however, without effective training, they are much akin to a headless chicken chasing a wild goose. It is important to note that there is no absolute ending of the training process; it is but a building block in creating a vehicle for continuous improvement. The initial training process acts as a stepping-stone towards understanding and elaborating upon the relationship between business and consumer, however it continues organically as an internal collaborative process. Early innovators who have taken the bull by the horns with robust training programs include Dell, Cisco and Dupont – all of whom are excelling with a pronounced social strategy. Whether or not its reputation is held in a positive light by today’s old school CEOs, social media is an integral part of today’s business culture giving organizations overwhelming access to the inherent characteristics, likes and dislikes of their buyer persona. Formalized social media training is the means of transforming you from an industry follower to and industry leader. Has your company invested in Social Media Training yet?